← A new camera? Maybe. I’ve hardly ever flown my JAS-39 Gripon EDF. In large part that’s because it only holds a relatively small (800mAh) battery and is still so nose-heavy that requires a full ounce of lead on the tail just to fly. I decided to pull it off the wall and see if there isn’t something I can do to make it a little more acceptable, but cutting it open and building a new battery tray to accommodate a larger battery and simultaneously shift the CG back so as to eliminate the need for lead on the tail. 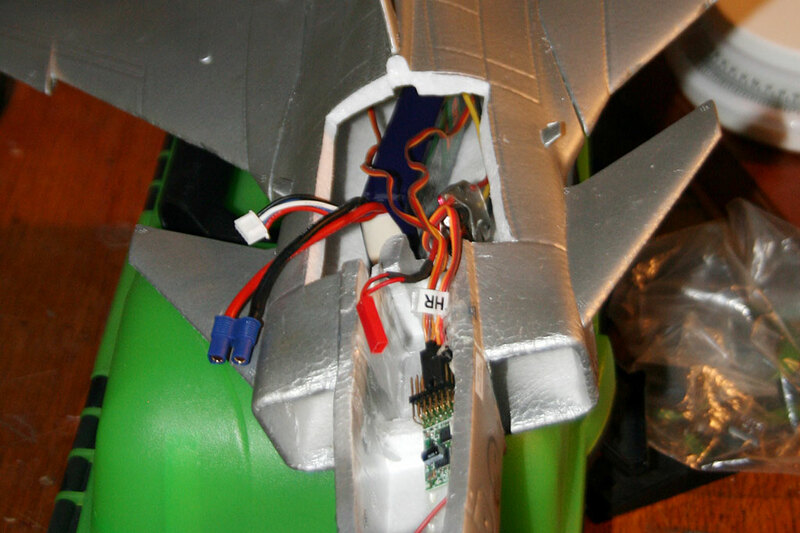 I started by chopping a *big* hole in the top of the fuselage so I can get to the area that will hold the battery. 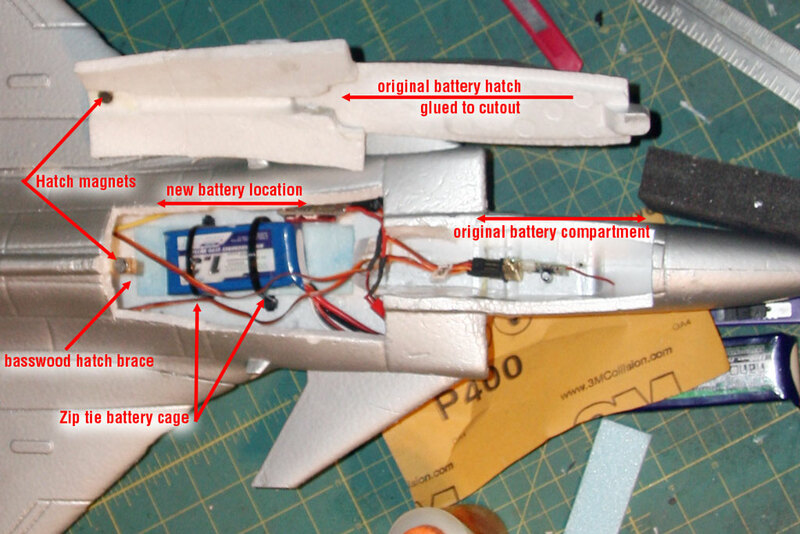 Here’s where the battery will have to go – way, way way back from the original battery compartment. I’ve decided to build for a 1300 mAh 3S. I moved the battery back 5″-6″, made a new tray from blue FFF and used zip ties to form a ‘cage’ to hold the battery in place. I’ll secure it front to back once I get the CG nailed. I cut out a very large section of the fuse to make access possible. I epoxied a small square basswood stick into the fuse and epoxied some rare earth magnets to the top of it. These mate with more magnets epoxied into the back of the new hatch. I’ve also run a small brace of CF strip across the fuse above the battery, to help replace some of the stiffness I’ve no doubt lost in the process. I’ve moved the battery back 5″-6″, cutting a huge chunk out of the top of the fuse. I’ve decided, as long as I’m in there, to replace the stock motor and fan with a Wicked Wemo combo from Don’s RC. This entry was posted in Custom & Modified, Electric Ducted Fans (EDF), My Planes, Repairs. Bookmark the permalink.